Plus, there is always free 3-day shipping. I love when Shopbop has a surprise sale and I loveeee your picks! Loving those fringe booties! I keep intending to go holiday shopping and buying for myself instead! Love the fur lined sweater! 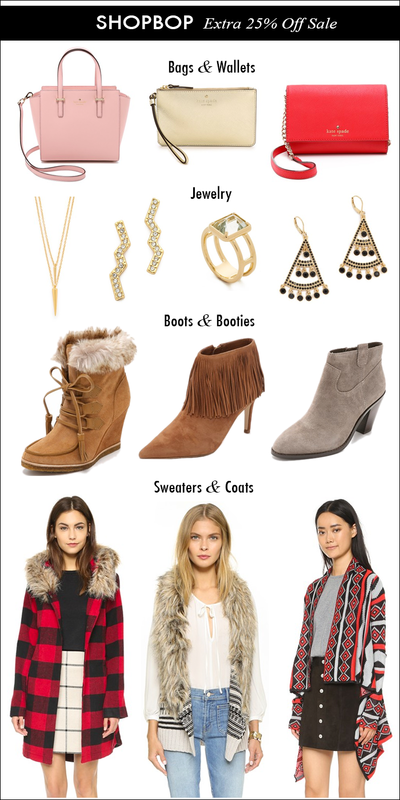 If I didn't already have those fringe boots, you better believe I'd be buying them! love those kate spade bags! cute picks! Such an amazing sale! In love with those fringe booties! I'll take one of everything! Especially loving the faux fur vest. Lovely selection. Fringe booties looks so gorgeous. Such a great sale! Waiting on my box of stuff to get here! Oh those boots and the sale! AHHH thanks for sharing! What a great sale! I love that buffalo plaid coat and the fringe booties! Ah, so many pretty pieces! Loving that ring and those earrings. And of course ALL of the bags and shoes!